A £5m livestock market, opening after opponents dropped a legal challenge and a long campaign, is "crucial" for the industry's future, says a union chief. 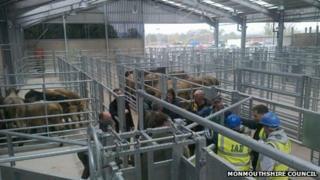 The new Monmouthshire livestock market was officially opened on a 27-acre (11 hectare) site near Raglan on Friday. It replaces Abergavenny's 150-year-old town centre mart 10 miles (16km) away. Farmers' Union of Wales officer Glyn Davies said: "It gives farmers security, they know they have a modern market for the next 50 years." The length of the lease was one of the elements insisted on by union leaders for their backing for the move. Monmouthshire council, which owns the land on which the old market stands, claims the redevelopment of the town centre site will help regenerate Abergavenny. Opponents fought a long campaign against the move, losing two judicial reviews in their fight to retain the historic 1860s market before conceding defeat in February this year. Monmouth livestock market closed in 2003 and Newport's market closed in 2009, leaving Abergavenny as the only livestock market in south east Wales apart from a sheep market in Cowbridge, Vale of Glamorgan. Mr Davies, who is the union's Gwent executive officer, said the Raglan market, which was officially launched on Friday. was much more suitable to the needs of farmers. He said: "It's crucial that we have this facility. "The existing one could have been closed down at any time in the name of animal welfare and animal health issued. The facilities were outdated, the pens were not big enough. "It was only the promise of this new market that enabled the old market to be kept running until now." "The existing market could have closed a long time ago and that would have been a total disaster. Farmers would have nowhere local to market their stock and would have to travel far greater distances - Brecon, Hereford, Ross-on-Wye - with that creating animal welfare problems." The new market has almost 400 pens and parking space for more than 100 lorries. The opening was carried out by BBC Countryfile presenter Adam Henson. Bob Greenland, deputy leader of Monmouthshire council and cabinet member for regeneration, said: "I'm delighted that the work on the project to build the promised replacement livestock market for Monmouthshire has run to schedule and that the market will open in late autumn, as we promised. "The first sales will be held there before the end of the year. At that point, we'll close the existing market in Abergavenny town centre to allow the construction of a new Morrisons supermarket, which will kick start a wider regeneration of the town." The new livestock market is due to open for business on 18 December.